Edgy! Now do supporters of Islam. One shows a man wearing a “Make America Great Again” hat with a Confederate flag tattoo on his arm and a Chick-fil-A cup in his hand. Another drawing shows a woman with the same red “MAGA” hat holding a Bible. This entry was posted in Christians/Christianity, Conservatives, Culture War, Donald Trump, Humor, Liberals/Democrats/Left, Make America Great Again, Media, Religion, Republican Party, social media, Trump Derangement Syndrome, United States, US Presidents and tagged Boston, Boston Red Sox, Chick-Fil-A, Confederate flag, Manhattan, New York, NYC, Sam Adams beer, Tom Brady, Winston Tseng. Bookmark the permalink. speaking of trash whitey bulger has died. Such childish behavior and wasted energy. Just more division. If they were not authorized by NYC officials, why haven’t they removed all of them? Paint one of those with a Torah or Talmud in her hand and see how long it lasts. This “Winston Tseng”, rich boy UC Berkeley grad, now a graphic artist in NYC? more of the same from the left. Blame your opponant/enemy of behavior that you yourself have practiced. the media will back you up, never tell your sordid story and the the sheeple will turn when the herd turns. First, we’re “deplorables”. Now, they call us “trash”. Democrats, the Hate America and Hate Americans Party. How Ironic. Leftist rallies leave tons of garbage and the locale has to pick up the tab for clean-up. Trump rallies frequently leave areas cleaner than they found it. If this ‘street art’ makes the lefties feel better about using trash cans, good. Trump’s got them encouraging each other to clean up after themselves. Ha-Ha-Ha. The joke’s on them. RED TSUNAMI – Come Tuesday GET OUT THE VOTE. New York City has always been a Democratic bastion, but for the past few years has been absolutely off the rails—at least in Manhattan and Brooklyn. I don’t see any end in sight to it. 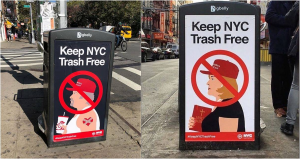 You mean these haven’t appeared on the sides of NYC buses yet?